Jandorf Lamp Socket, Low Profile, 660 W Lamp, 1000 V, Fluorescent Lamp Jandorf Lamp Socket, Low Profile, 660 W Lamp, 1000 V, Fluorescent Lamp, Plunger Terminal White slimline lampholders. For replacement use in fluorescent lighting fixtures as well as enclosed outdoor signs. Molded of white thermoset plastic for appearance and durability. UL Listed. Temperature rating of -40 to 65 degrees C.
All purpose, two terminal, standard. Accurately timed to combine starts with long bulb life. For use where lights are turned on more than five times daily. Also, in devices where bulb life expectancy is two years or less. No.BP45FS2: is used for 18" long 15 watt bulbs or 24" long 20 watt bulbs. No.BP45-FS4 is used for 36" long 30 watt bulbs and 48" long 40 watt bulbs. All purpose, two terminal, standard. Accurately timed to combine starts with long bulb life. For use where lights are turned on more than five times daily. Also, in devices where bulb life expectancy is two years or less. No.BP45FS2: is used for 18" long 15 watt bulbs or 24" long 20 watt bulbs. No.BP45-FS4 is used for 36" long 30 watt bulbs and 48" long 40 watt bulbs. Junction box cover plate. 4 inch. Jandorf Lamp Socket, 660 W Lamp, 600 V, Fluorescent Lamp, Medium Bi-Pin Base Jandorf Lamp Socket, 660 W Lamp, 600 V, Fluorescent Lamp, Medium Bi-Pin Base For use with ETI linkable LED fixtures. For use with one F14T8, F15T8, F18T8, F19T8, F14T12, F15T12, or F20T12 bulb. Minimum start temperature 50 degrees. 120 volt. UL and CSA listed. 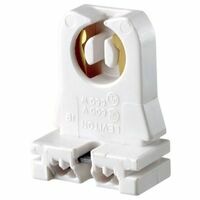 Universal non shunted bi-pin T8/T12 tombstone and U-shape tombstone replacement sockets. 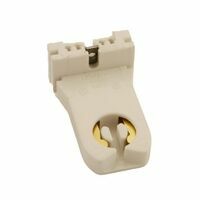 Universal non shunted bi-pin T8/T12 tombstone and U-shape tombstone replacement sockets. 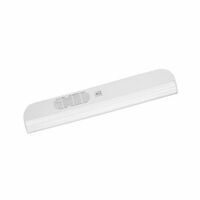 Good Earth Fluorescent Undercabinet Light, Corded, General Purpose, Good Earth, 15 W, 120 V, T-8 Bulb, Tubular Shape, White, 1-7/8 in Diameter, 18 in Length, 3-1/4 in Height, Includes: On/Off Switch, Plug-In Cord, (1) F15T8 Linear Bulb, cULus Listed, Acrylic Diffuser, Polymeric Chassis For task lighting, single reflector, Includes 5' cord and plug, uses two 40W T12 48 inch fluorescent lamps, not included. UL Listed. Long life fluorescent starter with condenser. Long life fluorescent starter with condenser. Long life fluorescent starter with condenser. Long life fluorescent starter with condenser.